Queen duvet cover (88" x 88") featuring the image "Aec Air Products" by Mike Jeffries. Our soft microfiber duvet covers are hand sewn and include a hidden zipper for easy washing and assembly. Your selected image is printed on the top surface with a soft white surface underneath. All duvet covers are machine washable with cold water and a mild detergent. I was bought up in the cab if such a vehicle..My father drove fir Air Products for over twenty years. 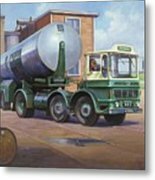 .Remember climbing up into the cab every day in the school holidays. .Excited, as each day was an adventure. .Lovely image brings back gond memories. . 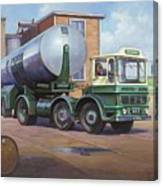 THIS PAINTING IN OILS ON A 18″�24″ CANVAS IS FOR SALE> E_MAILmike@transportartist.co.uk FOR DETAILS. PLEASE BE FREE TO COMMENT ON THIS WORK IF YOU LIKE IT! 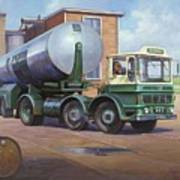 In 1964 the maximum gross lorry weight was increased to 32 tons on four-axle artics but carried a risk of overloading the tractor unit�s rear axle. 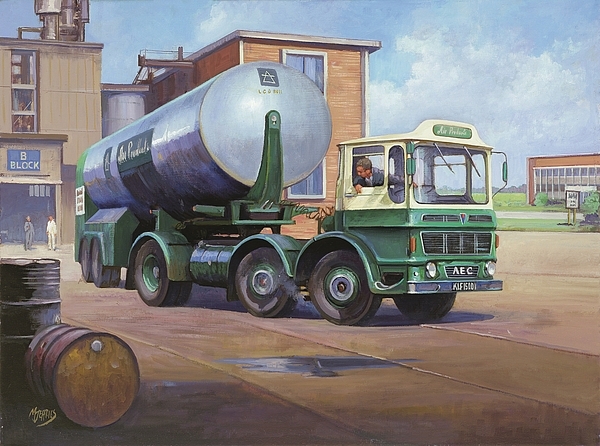 One answer was the layout adopted by AEC�s Mammoth Minor where a second steering axle on the tractive unit was added as on this impressive Air Products tanker. Please remember this image is protected by International copyright law.. You may download any image for personal or non-commercial use only.